MB Irish Green is my absolutely favorite green ink. However, the surplus of this ink in local boutiques is unstable and they often don’t have it available. On the other hand, the famous international store, where I frequently make purchases doesn’t carry MB inks. Omas green is slightly lighter but works well for me as an alternative to MB IG. Thank you! However, Omas is also not so easily available in my situation. Diamine Sherwood Green and Penman Emerald (the latter is a tough to find discontinued ink). And perhaps, J. Herbin Lierre Sauvage. Check out Cyabea's thread with all the Diamine inks. He has tested each color and you can get some ideas. I'll definitely look into Edelstein Aventurine. As for the PR inks: they have too many green colors to choose from. Which color is the closest to MB IG from your experience? Edelstein Aventurine=No!!!! 4001 Green is better...more green-green too. R&K Verdura beat MB Irish by a nose in a paper test I was dong, third by a neck was Pelikan 4001 green...a most under rated but widely available ink, that patted it's younger brother Edelstein Aventurine on the head while it kicked it in the pants. Aventurine feathers on some papers. Neither of the three green-green inks underlined feathered, all had sharp lines. I bought a bottle of Pelikan 4001 green on sale....I wasn't into green....a year later I have 11 bottles of various greens. Thanks for you suggestion! From the samples I've seen 4001 is a nice green but Edelstein looks closer to MB IG. I have to agree that MB Irish Green is a wonderful green. Probably my favourite as well. You want alternatives within UK and Europe. Where are you based? Why not just stock up with a few bottles? Wheelers Luxury Gifts has it for £11 a bottle with free UK Shipping. As for the comparisons. I have tried J Herbin Lierre Sauvage Diamine Sherwood Green and R&K Verdura, and while I like them, they just are not the same. Yes, I will stock some of course as soon as they are available again. Lierre Sauvage is a little light, but Edlistein Aventura is a fairly close match. Irish Green may be a little more saturated. KWZ Green # 3. At least in my L2K it's an exact match. 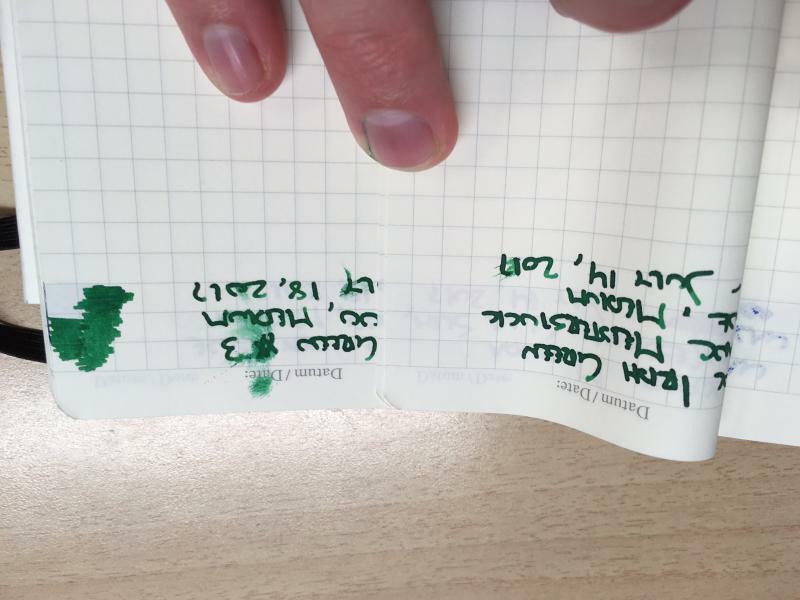 Noodler's-Green Marine is a little darker and a very nice ink, plus it has some water resistance. It does shade well except for the XF size nib. I think that Diamine Sherwood Green is a nice one. I would tend to buy Mb Irish Green, as it's readily available here. However, if you can't get it anywhere then I agree that Diamine Sherwood Green is a good alternative. MB Irish Green really is the chieftain of the green inks. Diamine Sherwood Green is a bit darker and leans more to the blue side of the green spectrum, but it's a very well-behaved ink. In terms of performance, I'd rank it very close to the MB. Private Reserve's Sherwood Green leans a bit more to the yellow side of the green spectrum. In my experience, it writes a bit dry and stays moist on the page for far too long. But it may be the ink whose hue most closely approximates MB Irish Green of those I've tried. I've never seen MB Irish Green live, but based on the photos I'd suggest Monteverde Green. Here's a review I did on the ink. I know the OP was looking for something easily available in Europe, but I'm including this for other people also looking for an Irish Green alternative.